In the modern home, chairs are more than just a place to plant your seat. They’re part of an overall design scheme, statements about your personal style and a way to complement your other furniture and art pieces. 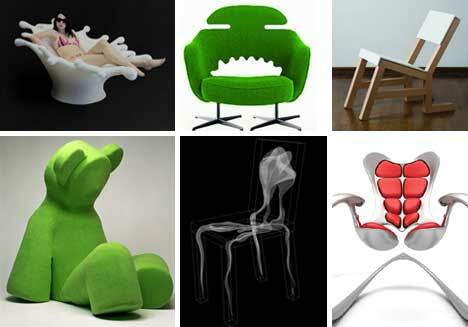 From ghosts and monsters to teddy bears and musical instruments, these modern chair designs are all about the unusual, the quirky and the totally unforgettable. 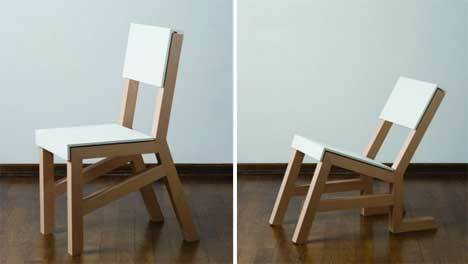 It’s not easy to design a chair that both grabs attention and looks like it isn’t there at all. 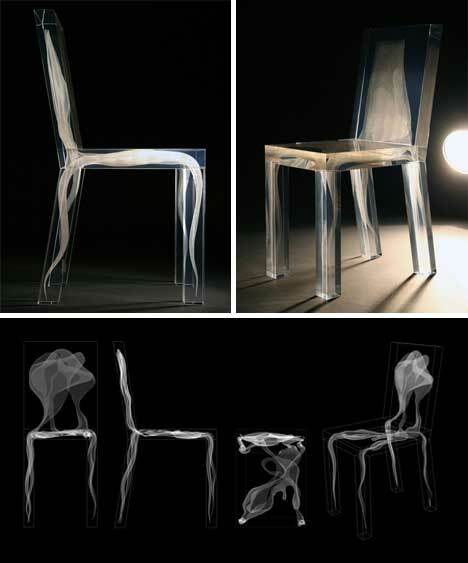 Design Drift presented their “Ghost Chair” collection in 2008: the furniture is made of clear plexiglass with laser-formed ghostly shapes inside each piece. In the right lighting, the plexiglass forms are invisible, and all one can see is the organic shapes inside which appear to be made of motionless smoke. If you’re looking for a space-saving chair that doesn’t economize on style, the Nesting Chair from Dripta Roy is just the thing. The solid wooden chair slides into several hollow chairs (and one solid center) when more seating is needed, then smoothly slides back together when the party is over and the house needs to get back to normal. Designer Michael Wendel was inspired by macro photographs of liquid droplets that looked comfortable enough to nestle into. 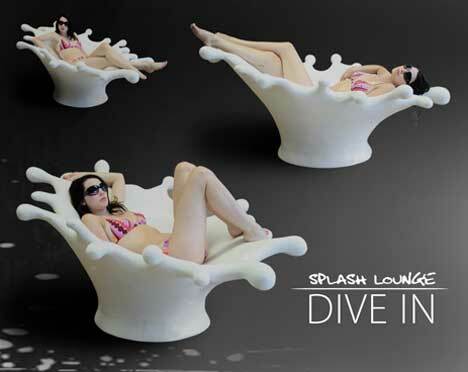 He took this kernel of an idea and turned it into a human-sized liquid droplet lounge chair. The painstaking process of making a scale model, plotting the full-size version, and building the chair layer by layer was obviously worth it, because the finished product is a stunning and impressive work of modern furniture art. 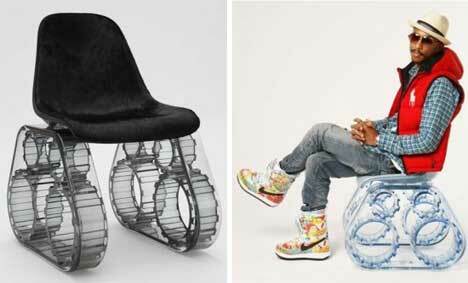 Furniture that seems to defy gravity is always amazing, and this transforming chair from Uros Vitas is no exception. 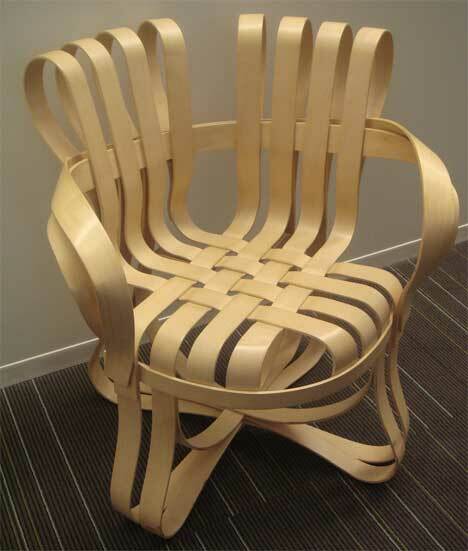 The wooden slats are held together with bands of metal that allow the chair to be rolled up when not in use. When the chair is in its fully extended position, it seems to magically hold itself there with no support other than the thin metal strips. Duck! It’s a Lounge Chair! For people with exceptionally long legs, or for those who just like to stretch out, the Ducking Lounge Chair has more than enough room. Resembling both a duck’s open bill and a swimming pool’s diving board, this unique chair provides just enough “give” to be comfortable without toppling over. 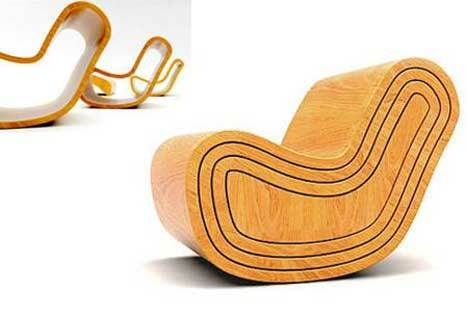 They may look like musical instruments, but these chairs are more an exercise in relaxation. They’re designed to be filled with sand which shifts and sways with every rock of the chair, making a beautifully organic beach-like sound. Meant to be both urban and natural, these beach sounds chairs allow a leisurely nature experience in the comfort of one’s home. If origami is the art of folding paper, and modern furniture design is the pursuit of creating bold new pieces for the home, this chair is the perfect marriage of the two. The clever folding mechanism uses thin, movable plastic to collapse the full-size chair into a far more compact size, leaving you with some extra storage room and bedecking your home with a truly unique and sophisticated dining chair. 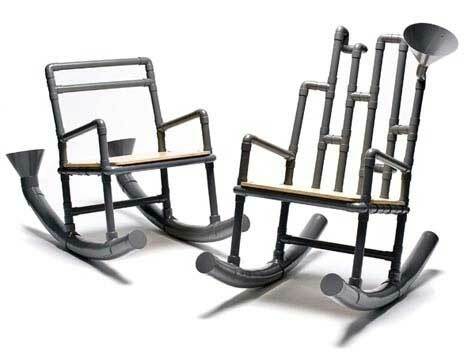 Designer Jennifer Heier wanted to shift the subject/object roles of humans and their furniture, so she created, among other unusual furniture items, the ReLegs Chair. 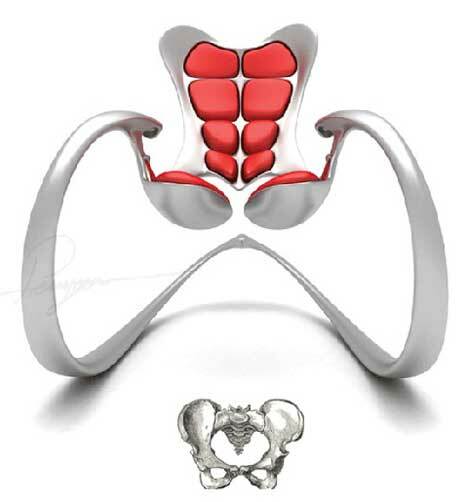 It functions just like a normal chair, but it features “knees” that allow its legs to function in a way similar to human legs. The designer says that the upright position is for regular sitting, and while the reclined position is more comfortable for the sitter, it is not so for the chair, which has to prostrate itself for human use. Whether or not the chair knows it’s kneeling is not up for debate; all that matters here is this incredibly unusual design. Designed to both resemble and pamper the human body, the Ruby Rocking Chair includes water-filled “smart pillows” to cushion the back and bottom. The cushions are available in different sizes to fit every body type, and they help keep the skin cool in warmer environments. 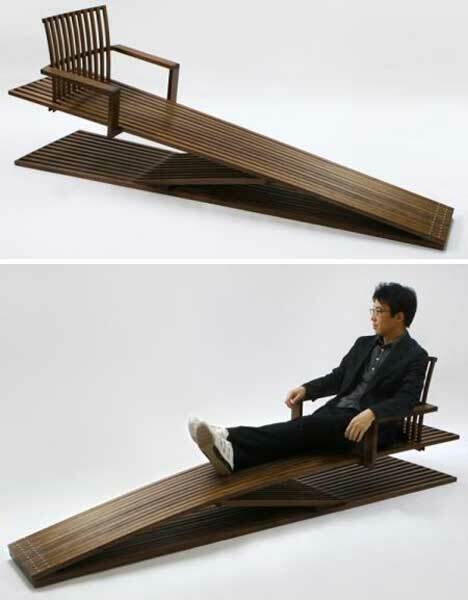 The chair’s designer, Pouyan Mokhtarani, wanted to create a piece of furniture that would offer unparalleled comfort, and he claims that sitting in it once will make you feel like you can rule the world. Bathtubs are often a refuge in the home, a place where we go to relax and get away from the hassles of everyday life. It only seems logical to turn this oasis of comfort into a lounge chair. That’s exactly what designer Baek Ki Kim did with this elegant reworking of the classic bathtub aesthetic: smooth rounded lines and a sense of being enclosed in a (temporarily) private world. Do you ever miss the warm embrace of your favorite childhood teddy bear? 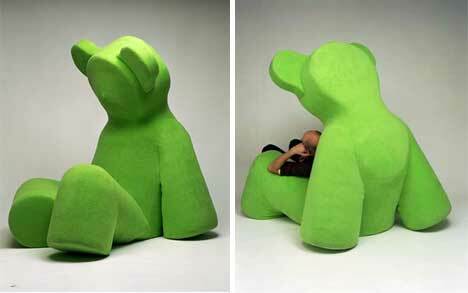 This giant stuffed bear armchair from artist Matti Klenell takes the comfort of a favorite stuffed animal and blows it up to massive proportions. Designed by legendary architect Frank Gehry, the Cross Check armchair was inspired by the woven apple crates Gehry used to play with as a child. The smooth, flowing lines of the interwoven lightweight maple strips make this chair seem more delicate than it actually is. 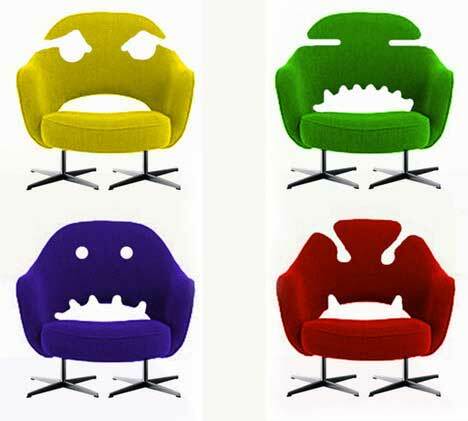 Old office chairs just seem to have monster-sized personalities – at least that’s what one artist thought. These conceptual office chair hacks take a staple of the furniture world – the classic Eero Saarinen office chair – and turn it into a fun and hilarious new product using the pre-existing characteristics. 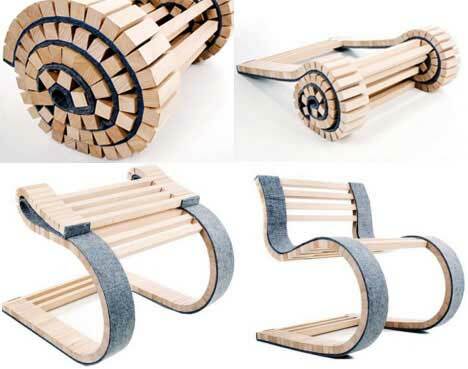 This chair concept is so modern and forward-thinking that it doesn’t even require a seat at all. 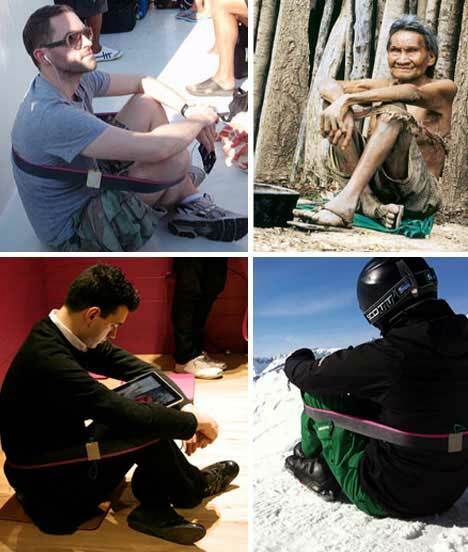 The clever invention is little more than a strap that you wrap around your legs and body, holding your legs up into a natural folded sitting position. As long as you don’t mind perching on a floor or sidewalk wherever you happen to be, this has to be the most compact seat design ever.